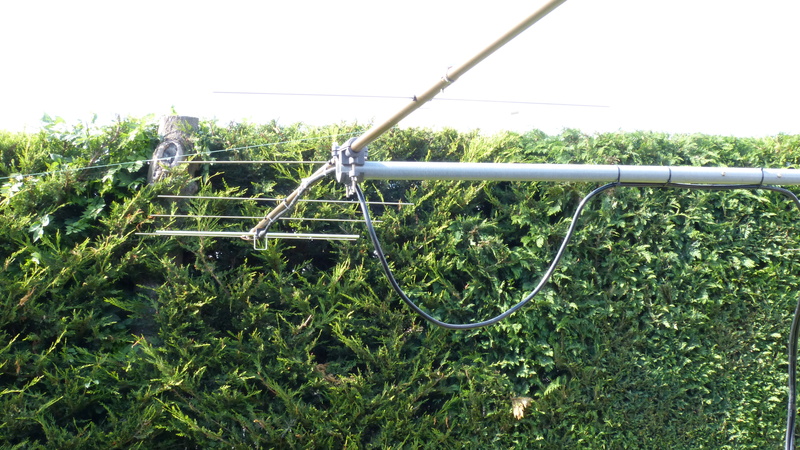 Having had excellent results with a single yagi I soon wanted to add an additional antenna to get some extra gain on both TX and RX. I originally planned on using a second 9 ele DK7ZB but changed my mind when I started to look at some of the “challenges” of baying two antennas (or using X-pol!). I wanted an installation where the main cross-boom did not require any additional bracing and also the antennas did not need any under or over bracing to keep their booms straight. In hindsight, when I built the DK9ZB’s had I used smaller diameter material for the elements and perhaps a thicker section boom I would possibly not have needed any additional support to stop them sagging. I used the maximum diameter of aluminium tube that the G-5500 can take in its standard form; in the UK this was 1-5/8″ (approx. 42mm dia.) and I chose 1/4″ (approx. 6mm) wall thickness. 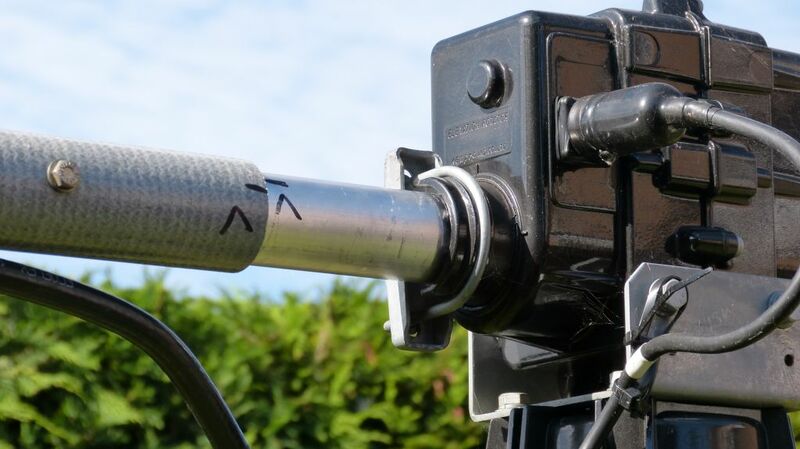 The remaining sections of the cross-boom are made up of 50mm diameter, 4mm wall fibre-glass tube. The aluminium and fibre-glass sections are joined together using 2 x 5mm bolts. The total weight of the cross-boom, without any additional hardware was 5.4 kilo. Here you can see both sides of the cross-boom and one of the I0JXX yagis. The cross-boom does not require any additional support bracing. 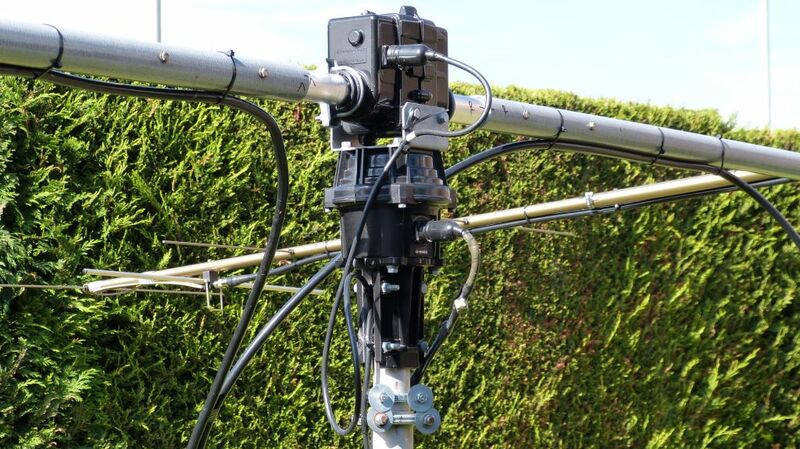 The coax feed must not run in-line with the yagi elements. this photo shows a large loop of coax before it is strapped to the boom. 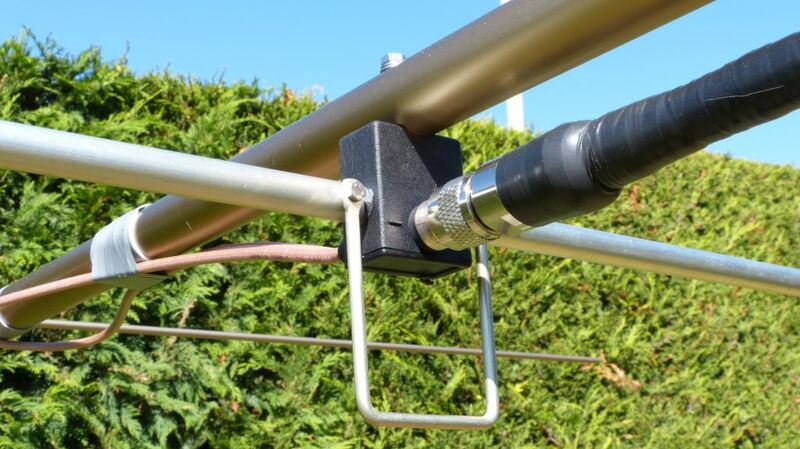 Here you can see the new updated driven element on the 8 element I0JXX yagi. The original “T” feed has been replaced with this new design. The cross-boom continues to support the two antennas with hardly any noticable sag. As mentioned earlier, sourcing the fibre-glass tubing proved to be a real challenge. After much searching on the Internet I found a local company (Anglia Composites) that sells a range of cut length GRP tubing as part of their modular handrail system. I purchased and collected from them 2 x 1500 mm lengths of tubing in grey.